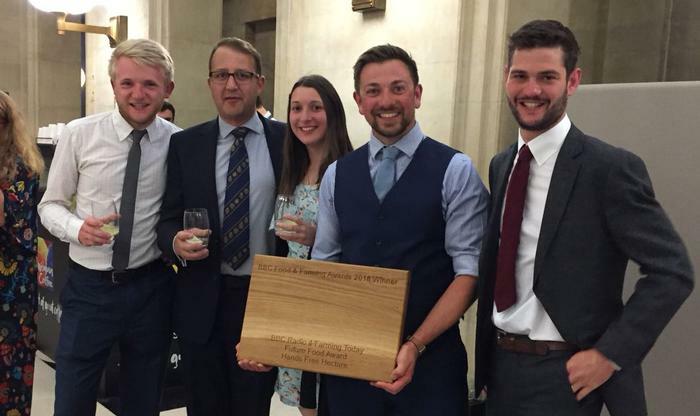 The Hands Free Hectare (HFH) project, run by Harper Adams University and Precision Decisions, has won the Future Food Award at the BBC’s Food and Farming Awards ceremony which was held in Bristol last night. Last year the world-first project drilled, tended and harvested a crop of spring barley without operators on the machines or agronomists in the field. This year the team are growing a hectare of winter wheat, thanks to AHDB funding. The project was demonstrated for the first time away from the university campus earlier that day at Cereals 2018, near Cambridge. The combine’s first demo, held in the morning, didn’t fully go to plan but the team worked hard to ensure it would be ready for the afternoon slot; which proved to be a success and received a fantastic reaction from the audience. Project Lead and Harper Adams Agricultural Engineering Lecturer Kit Franklin said: “It was a race to get from Cambridge to Bristol in time for the awards ceremony. “We left Cereals on a high after our combine performed so well, but then the nerves started to kick-in while we were waiting for the winner of our category to be announced. “It’s an amazing feeling to have won this award, especially with Alex James, who was helping to present the awards, commenting on how cool the project is. Director of Precision Decisions, Clive Blacker said: “It’s fantastic that the project has earned this level of recognition. In the past year it has gained global publicity and the team have spoken at a number of conferences around the world, but for it to now be an award-winning project puts the cherry on the cake. Jonathan Gill, Mechatronics Researcher, added: “We want to say a huge thank you to all of our sponsors and supporters; without them, we wouldn’t have been able to achieve this. Joining Kit, Clive and Jonathan at the awards ceremony were Precision Decisions’ Martin Abell, Mechatronics Engineer for the project, and Harper Adams University PR & Communications Officer, Adreen Hart-Rule, who handled the PR for the project.